Fine-dining, circus theatrics and groove-laden music converge at the glitzy venue's season crescendo. 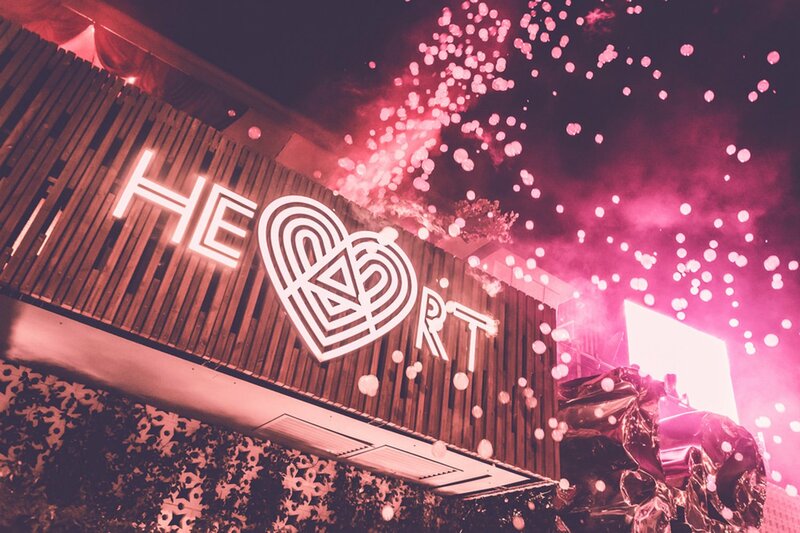 Letting the curtain drop on a spectacular season littered with entertainment, high drama and outrageous good music, HEART Ibiza's closing is set for Sunday 7 October. Never a venue to do things by halves, HEART has once again called on the big guns for the "go-home" show. Apollonia top the bill in what is sure to be a star-studded affair with a glamorous but in-the-know audience. Digging a little deeper into the confirmed artists, here's what you can expect on that enchanting night. Apollonia is a unique entity in the world of electronic music. A studio partnership, a back-to-back-to-back DJing tour de force and also a record label for the members and their friends - Dan Ghenacia, Dyed Soundorom and Shonky are all-conquering in their pursuits. Famed for their marathon sets, here is a trio whose preference is to lock in their trademark groove over an extended period of play time, instead of brisk - and frankly impotent - shorter sets. An allocated four-hour time slot, therefore, represents an attractive prospect indeed. In 2018, the tri-fecta have scaled things back, proving less is more. Last year they were a huge part of Music On's programming. Although they have still made a handful of appearances at Marco Carola's techno mecca this year, they have instead been more nomadic. Thankfully, we have still been able to catch them at Circoloco - the place where their Ibiza legacy was born. Apollonia are still crowd-pullers at DC10. It is definitely a case of quality over quantity for the particular and aesthetic-conscious band of French brothers. That trait alone guarantees a musical adventure crafted to meticulous attention and detail. The trio is joined by fellow countryman Traumer. Traumer has found favour on Loco Dice's Desolat imprint with his infectious, jazz-infused and often rugged take on house music. His style makes him the ideal foil for Apollonia. Arguably Traumer's biggest hit, Hoodlum still does damage on the dance floor. More recently Traumer hooked up with Parisian legend DJ Gregory to release on FUSE London. Ibiza 2018 saw Traumer make several appearances for Cocoon, two of which occured inside Strangers In the Night, Pacha's intimate Room 2. One thing we're certain of, it will make a refreshing change to catch him at HEART on Sunday 7 October. The fifth French national showcased is rising talent Salomé, another product fostered by the rich cultural backdrop of Paris' underground. Salomé's love affair with electronic music was nurtured in the city's record stores, nightlife and amid a network of like-minded aficionados. A rarity in today's scene, Salomé is an artist who has forged her way predominantly as a DJ, as opposed to producing her own tracks - underlining her devotion as a lover and curator of music. Far from being two-dimensional, the multi-disciplinarian often lends her vocals to other producers' material. Salomé has stormed Ibiza 2018, playing a pivotal role for Black Coffee at his Saturday night Hï residency. Being handed responsibility of closing HEART is an honour well-deserved. From Burning Man to the Balearics, Salomé is taking over. Completing the bill and mixing things up, Tuccillo is one of HEART's in-house crop and a homegrown DJ. The HEART Deja Vu resident is likely to open proceedings on the night. Knowing this venue so well, he will be making sure that we will be in safe hands, meaning it will be well worth getting down early and watching this special night build. We also have the promise of a secret guest yet to be confirmed, so there are still some aces left up HEART Ibiza's sleeve. Irrespective of who the surprise act might be, the line-up is already more than alluring as it currently stands. HEART has had an exceptional season. Cirque du Soleil creator and the Adria brothers party concept of fusing food, music and art has captured the imagination of islanders with its well-honed programme. Nothing changes for the closing - with the farewell shaping up to be a fitting denouement. Those ravishing tickets can be picked up below, along with all the latest information.